If you’ve not heard of SCF before now it’s understandable. He’s a Dutch developer and artist who works on solo projects, primarily RPGs but there’s a shooter in his body of work too. Possibly his highest profile release to date has been Exit Fate, a solid and enjoyable JRPG that utilises the RPG Maker game creation set to good effect. My Boxed Universe has managed to snag a moment of his time to ask him some questions regarding Exit Fate and its predecessor Last Scenario. Firstly a big thanks for taking time out of an otherwise extremely busy schedule to do this interview, it is greatly appreciated. For those not in the know, can give us the sales pitch for Exit Fate? Sales pitches aren’t my strong point, but I’ll give it a go. Exit Fate is a freeware RPG made with RPGMaker, featuring a large cast of characters and 20+ hours of gameplay. You play the role of Daniel Vinyard, a colonel accused of betraying his own side, as he tries to discover the truth and put an end to the ongoing war. Guaranteed to be worth the price. Am I correct in assuming that Exit Fate and Last Scenario are your only two official forays into the RPG genre so far? It’s a little more complicated than that, because Exit Fate is actually a remake of a game I made back in 2003 and never released outside of a small community. Before that, I made another half-serious RPG, but that was more of an exercise to learn how RPGMaker worked. Only with Last Scenario did I start releasing games to a wider public. What was the motivating factor in creating an RPG? What games inspired Last Scenario and Exit Fate? The predictable answer is that I started making RPGs because I enjoy playing them. I also like coming up with both game mechanics and storyline, so RPGs seem like a natural fit. Last Scenario wasn’t really inspired by any particular game, but more by (J)RPGs in general. I set out to try to make something interesting out of a bunch of common cliches. There’s a lot of RGPs parodies out there, but they tend to go for the same old fourth-wall-breaking, “look how weird RPG mechanics are when taken literally” jokes. I tried to do something different by embracing the cliches and taking them in an original direction. Whether I succeeded in doing so or not is for the player to decide. As for Exit Fate, it should be clear to anyone who’s even looked at a screenshot of it that it borrows a lot from Suikoden 2. That’s not to say the game’s a straight copy, but the basic framework is very similar. Exit Fate shares a lot of DNA with the Suikoden series, in terms of gameplay and epic scope. When did you first encounter that series and did you always want to create a game using those systems or did you find yourself falling into it as it best fit the narrative? I played the first two games in succession, many years ago. The first one didn’t leave as big an impression on me, but Suikoden 2 instantly became one of my favourite games. It’s hard to say why exactly I ended up making a game like it. I think it was a combination of many things: I liked the gameplay, I had just gotten into RPGMaker and found a good resource for Suikoden 2 tilesets, and I just wanted to make something similar in scope to Suikoden, with a large cast. What was development like on Last Scenario? Did it run smoothly or were there some large obstacles to overcome? What lessons did you learn and take forward into producing Exit Fate? 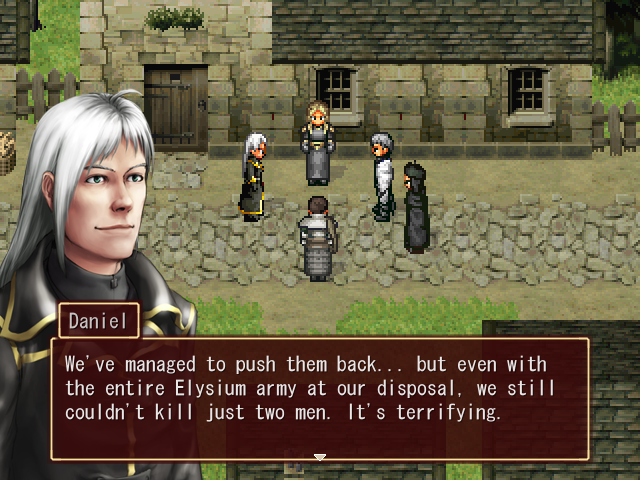 I learned a lot from making Last Scenario, because it was my first time using RPGMaker XP. Compared to the older versions, it gave me a lot more freedom, but it took some time to really figure out how the engine worked. That’s why, compared to Exit Fate, the game looks and plays a lot more similar to the RPGMaker default. I don’t think there were any major obstacles. I was very excited to work on the game at the time, which was mostly an advantage, but I did get ahead of myself in some regards. That’s why some plot points weren’t planned out very well. I didn’t think everything through carefully, so some events are a bit contrived. Both of your titles are combat heavy and the combat systems themselves are slower than some other JRPG titles made using RPG Maker, was this a conscious decision on your part? I wasn’t aware the combat systems were considered slow. The Last Scenario battle system is actually 90% the stock RPG Maker battle system, with just a few modifications. I’m somewhat surprised by the question, because compared to big-name RPGs I tried to make my battle system much faster. 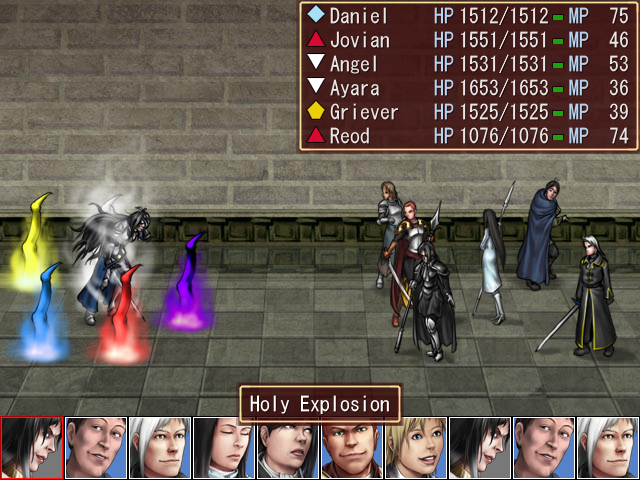 Modern RPGs tend to have very long attack and spell animations that get tedious after a while, and in older RPGs you were forced to wait for turn bars to fill up. I tried to keep animations relatively short, and have as few unnecessary pauses as possible. What made you choose RPG Maker and which variation of the popular series did you use to create your titles? I started out with RPGMaker 2000. I think that, back then, there weren’t really any good alternatives. Even though the 2000 version was very limited, I was really excited to finally have a way to make a real RPG. Not long after that, RPGMaker 2003 came out, which had a few improvements, but after making the original Exit Fate I lost interest and focused on other things than making games for a while. It wasn’t until RPGMaker XP that I was drawn back into it, and that’s what I used to make Last Scenario and the remade Exit Fate. The difference between XP and older versions in terms of flexibility is huge, so that gave me a lot more freedom to make my game the way I wanted it to be. What was the experience like on RPG Maker? Do you wish you’d used other options in hind sight? I don’t regret using RPGMaker, because I don’t think I would’ve been making games without it. As for my experience, I was very happy with RPGMaker XP. It’s not without its flaws, but if you have some programming experience it’s very easy to get into while still being very open. The main downside is the editor itself. For example, it’s very easy to add stealing to the battle system scripts, but the enemy editor still won’t have an entry for “item to steal”. So the more non-standard your gameplay is, the more the rigid editor gets in the way, and you have to get creative to work around it. Did you receive much help or have you had much feedback from the RPG Maker community? Not really, but that’s because I never interacted with the RPGMaker community. I got a few resources from there (like the world map tileset), that’s about it. Have you been pleased with the feedback and total downloads for your (FREE!) games to date? I’ve read reviews for Exit Fate that vary greatly but nobody can fault the quality of your production. I was genuinely overwhelmed by just how popular Last Scenario turned out to be. It was my first time releasing something to the general public, and I didn’t even know if anyone would like the game. There’s always that slight fear that the response will be largely negative. Anyway, it turned out to be the opposite, and I was blown away by how many downloads I was getting, even years later. I’ve received a lot of positive feedback, and I really appreciate it. I’m not all that satisfied with how the games came out, but I’m happy to know people enjoyed playing it. I haven’t read many actual reviews, and I’m sure some of them will be negative, but I’m aware the games have many flaws, and you can’t please anyone. It’s not that I’m shielding myself from criticism, but past a certain point, it’s going to be a matter of taste. After all, RPGs are hugely divisive even among fans of the genre. All you have to do is ask a group of people what their favourite Final Fantasy game is, and you’ll see what I mean. Did you ever consider making a move into all-original assets and producing either of these titles for the Indie market? After finishing Exit Fate, I wanted to do exactly that, but it’s been proving difficult. The sheer amount of assets required for an RPG is daunting, and on top of that I have more experience drawing portraits and backgrounds than, say, tilesets and spell effects. So not only is there a lot more work to be done, I also have to learn how to do that work well. At first I was very interested in all the new options for indie developers that have been popping up over the years, like Kickstarter or Steam Greenlight, but after a while that enthusiasm faded. Simply put, money isn’t the bottleneck for me, it’s motivation more than anything. And if it takes several years to finish a game, I’m not going to make a living off it anyway. So for now, I’m still planning on releasing anything I make for free. The strongest point I can find in your titles is the strength of the writing, the stories are well balanced and the characters voice adult opinions that seem natural in outlandish circumstances. Do your games start with a story concept or a system of gameplay and build outward from there? I think it’s a bit of both. Most of the gameplay isn’t directly intertwined with the story, so they can evolve more or less independently. Storywise, I mostly just start from a simple concept, and build upon that layer by layer, until I have a solid enough framework that I can start filling in the details. And by the way, I don’t really think that highly of my writing. I’m rarely satisfied with my stories and dialogue, and they certainly fall short compared to good writing in other media. The fact that my games have attracted praise from a number of people just shows, in my opinion, the low standards for writing in most professional JRPGs. The artwork used in your titles is excellent and really stamps a personality on games you’ve made. How many designs did some of the characters go through before you settled on a final look for them and with such a large cast in Exit Fate what challenges did it pose? Because the cast of Exit Fate was so large, I didn’t really get to go through multiple designs per character. The biggest challenge was just drawing portraits and sprites for all of them. That’s also why the battle animations in the game are so simple: even having just 4 frames per character, that’s 300 in total. Were there any concepts for story or gameplay that didn’t make the final product? It’s hard to remember, since it’s been a while. Most changes happen early in development when the story is still evolving. There’s some small scenes here and there that didn’t make the cut, but nothing significant. Can players expect to see a new RPG from you any time soon or are you holding back for now? Definitely not soon. I have been working on something, but progress has been very slow. I’d like to say more, but I don’t want to get anyone’s hopes up. Are there any developers out there at the moment that you’re following? What kind of games excite you? I don’t actually play a lot of different games. I still like RPGs, but I can’t justify buying a console anymore for the one or two games I’d play, so I’m reliant on what gets ported to PC. Outside of RPGs, I don’t really have a special preference for any type of game. I’ll play all sorts of games, if they’re good. Thanks for taking the time out to answer our questions today, and a big thanks for producing such excellent entries into the RPG genre. Readers can visit the SCF website HERE and can pick up Exit Fate and its older sibling Last Scenario for the low, low price of free. Be sure to give them the time they deserve.